Latest News on "Living the Reiki Way"
Tarcher, my American publishers, have a new venture--Tarcher Inspiration Cards—and they have decided to produce a deck of 64 illustrated cards based on excerpts from the latest of my books to be published in the USA, “Living the Reiki Way” as a boxed set of “Living Reiki Healing Cards”, for publication at the end of December 2013. Each card has a different illustration on the front—see the sample on the left—with a title across the centre, and appropriate text excerpts on the other side. I’m really proud of them, and think they’re beautiful, so I hope they do inspire people when they become available. 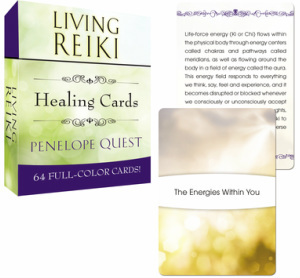 If you would like your own set of “Living Reiki Healing Cards” they can be pre-ordered now from www.amazon.co.uk currently at £9.27, or from www.amazon.com for $12.88. 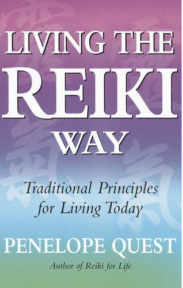 Chapter 1 - What is Reiki? PART 2 - LIVING IN THE "NOW"